Why did I buy that? What was I thinking? I don’t even need this! Do you ever look at your bills and wonder why you spent so much money? Maybe your downfall was the dollar bin at Target (that was mine.) Maybe you got carried away with the fancy cheeses at Whole Foods. Whatever it was, now you’re wishing you could have that money back. 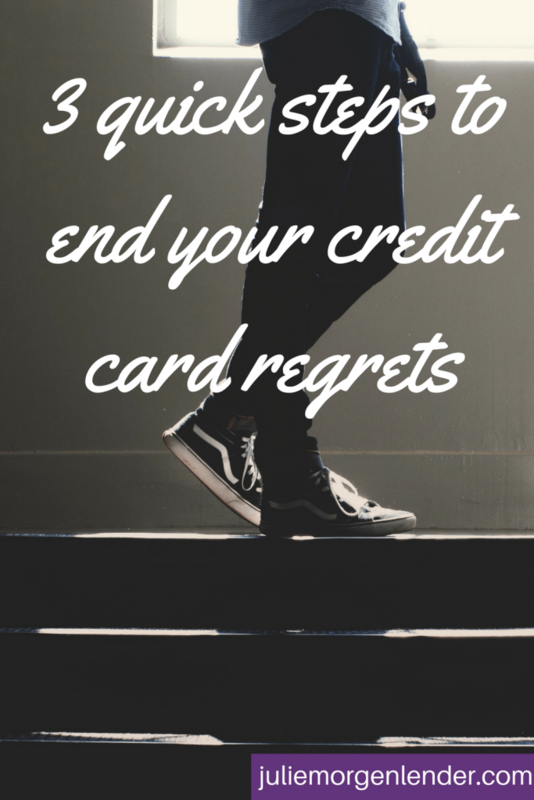 I hate that feeling of credit card regret, and I bet you do, too. So let’s end it. Right now. Step #1: Where’d they go? It’s easy to overspend on a cute sweater or lunch out when all you need to do is swipe your credit card, without any thought to the long term effects. It’s a lot harder to overspend on those things when you literally don’t have the money to do it. If you can cancel your credit cards, go for it! But there are a lot of reasons why you might not be able to cancel them. Maybe you’re about to buy a house next month and you can’t take the hit to your credit score. Maybe you have debt on your cards and you can’t close them until you pay off the balances. Maybe you want the peace of mind that having a backup credit card gives you. Those are all fine reasons. But they don’t mean you need to carry your credit cards with you at all times. Instead, take those babies out of your wallet and leave them at home. You are now operating with cash. If you don’t feel comfortable with cash, use checks or a debit card. Either way, you won’t be able to spend more than what you have available in your account. Important: To be sure you don’t accidentally spend your rent/mortgage and other necessary expenses, put those in a separate account. Your debit card and checks should be linked to an account that’s only for spending on extras, not the necessities. 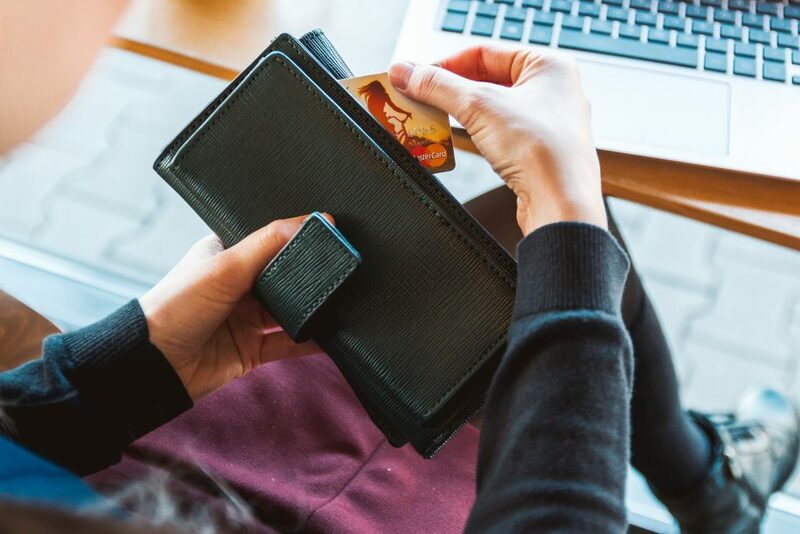 It’s one thing to take your credit cards out of your wallet, but make sure you don’t have easy access to them. This will be especially important for Step #3. One client shredded hers. Another was able to put them at the back of a drawer and ignore them. You could put them all the way at the bottom of a box of books at the back of a hard-to-reach closet. Or my favorite: put your cards in a sealable plastic bag, then put that bag in a small container and fill the container with water. 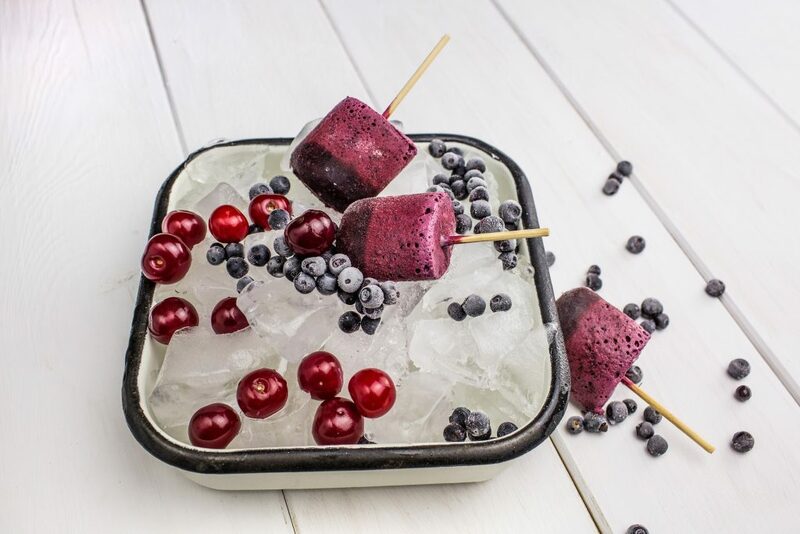 Put the contain in your freezer so that your cards are literally frozen! What do all of these tips have in common? They make your cards hard to get at! Now you have to dig to the back of the closet or thaw a huge ice cube to get at your cards. That gives you plenty of time to rethink your spending plans and consider if they’re actually worth the effort. If you’re lazy like me, you won’t want the bother. Thanks to Steps #1 and #2, physically paying for something with a credit card is no longer an option. But we don’t live in a world of only physical shopping any more. Now there’s online shopping, and a lot of people forget to account for that when they’re stepping away from their credit cards. How many times have you clicked “Purchase” only to regret it a few seconds later? You don’t even have the item yet, but it’s too late to cancel the order. Well, that won’t be happening any more. Look at your credit card bills from the last 6 months and write down any purchases you made online. Now go to each of those sites and delete your credit card from your account. I know this is hard, but you can do it! No more click-then-regret cycles. 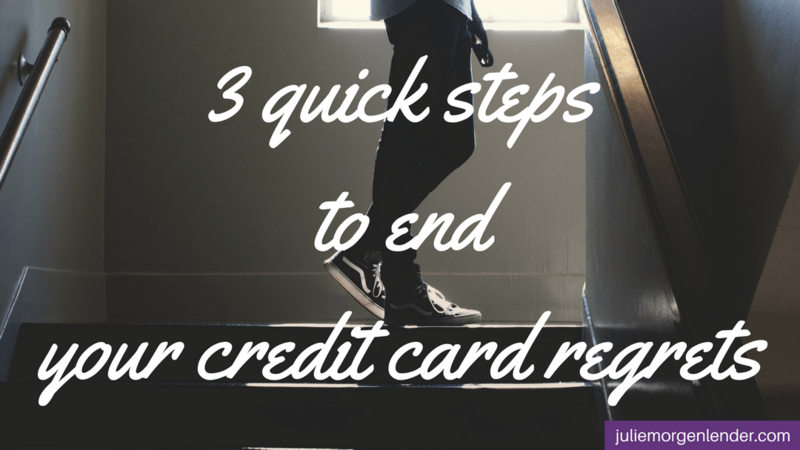 Your credit cards are hidden away thanks to Step #2, so you can’t fall back on those easily. From now on, if you want to buy something you will have to use your debit card, which means you can’t spend more than what’s in your account. And since you won’t be saving your debit card information either and will have to get your card from your wallet and type in the number every time, you will have plenty of time to consider if you really want to make that purchase after all. If you’d like a free copy of this infographic, keep reading to the end. What if I already pay my bills in full every month? This is a trick question. When you pay your bills in full every month, you don’t have debt, so it’s easy to feel that none of this applies to you. But just because you pay your bills every month doesn’t mean you aren’t spending more than you should. Unfortunately, I know from experience. Follow all three steps and watch what happens. Don’t we all need credit cards? Nope. Plenty of people do just fine without using credit cards at all. If you’ve always had one, it’s easy to think they’re necessary, but living without one for a bit will show you that’s simply not true. I’m hoping you have an emergency fund. If not, start one today. If you don’t have an emergency fund, you might need to use a card. But reserve this for actual emergencies. Wanting the latest iPhone or new cute shoes is not an emergency. Isn’t this unnecessary if I follow a budget? If you have a budget that works for you, you aren’t overspending at all, and you never have regrets about your purchases, then go with it. 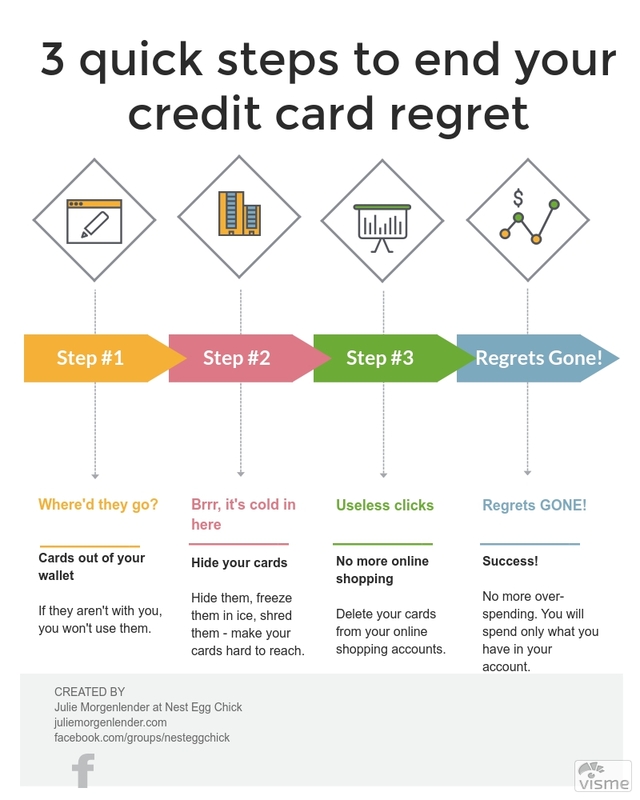 If you still overspend and have regrets, then give this a try. What have you got to lose? Yes. Yes it could. So go for it! It’s time to end those regrets! How can I get a FREE copy of that awesome infographic? Thanks for asking! If you would like your own FREE, downloadable copy of the infographic above, just enter your email address here and I will send it to you right away.